The house had to be designed in such a way that there was a maximum relationship with the environment. Before Brouwhuis, the residents lived in an impressive building in Tilburg, which turned out to be too big once the children had flown the nest. ‘They wanted a new house for two people, but with enough space,’ De Brouwer says. ‘The house had to be cosy and have a similar standard of finish to the old house.’ In addition, it had to be designed in such a way that there was a maximum relationship with the environment. These requirements combined with a few mood boards created by the residents resulted in the final design. The house is 27 metres long and 6 metres wide. Inside, all functions are connected linearly. The wall is closed on one side, where cars and walkers pass by. This was also done because there is now a road that runs through the woods, parallel to this closed wall. However, a glass entrance was added. On the closed side, there is also a block containing all technical equipment. This element has been made bigger and more sculptural so that it resembles a chimney. In contrast, the other side of the house is largely open thanks to the many windows and slim aluminium profiles by Reynaers. The aluminium windows were coated to create a matte, almost steely look. Triple glazing reduces cold downdraughts to a minimum. In the short video below, architect Jacq. 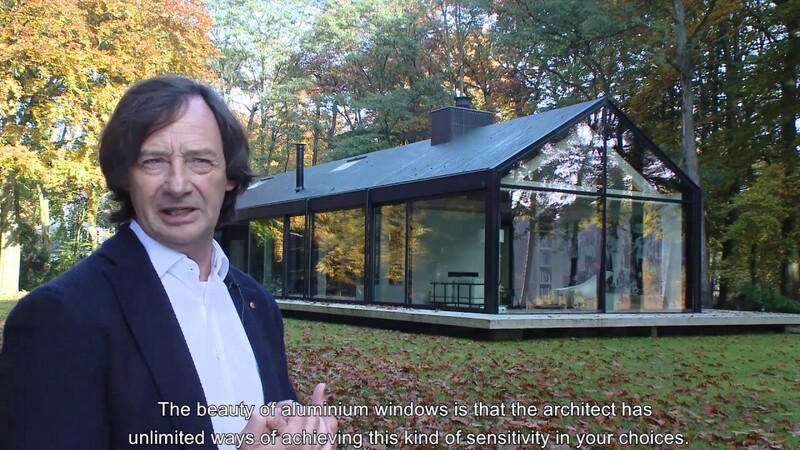 de Brouwer of Bedaux de Brouwer Architecten talks about his design. A lot of wood was also used in the interior, designed by interior design firm Studio INAMATT. One striking element of the house is the concrete platform it sits on. ‘This has both a functional and aesthetic purpose,’ says De Brouwer. ‘It’s practical because as a resident, you are higher than the walkers and cars passing by. In addition, it makes the house look like a stiletto-wearing guest in the landscape, so the house claims less space.’ Separation between the garden, designed by MTD Landschapsarchitecten, and the surrounding nature reserve has been kept to an absolute minimum. This does mean that walkers will occasionally walk through the garden. A recess in the floor plan of the house forms the terrace. This dent also results in two corner windows in the kitchen and bedroom, increasing views of the garden.